Are you EXCITED to meet up again? 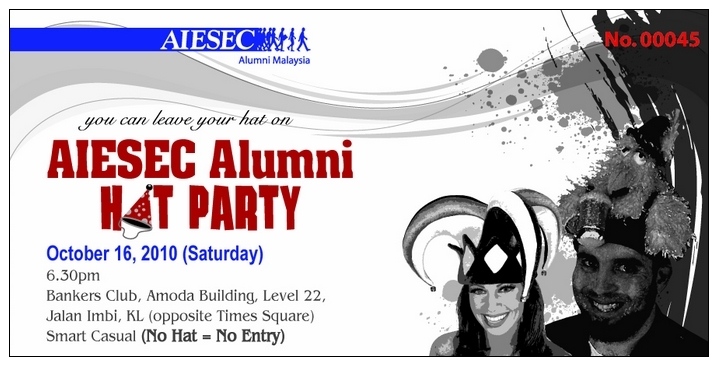 AIESEC Alumni Malaysia will be having our very own HAT party! 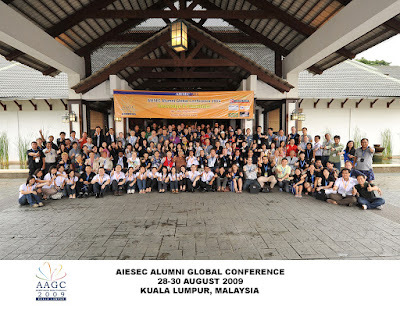 Our objective is to reconnect all former AIESECers throughout Malaysia with the opportunity to re-live the AIESEC experiences, catching up with the good old days, networking and most importantly to have fun, the AIESEC way. This year’s theme is HAT PARTY. Be sure you come with your very own hat or else you will risk staying out!! This time, we will be having it at the prestigious Banker’s Club on 16th October 2010 !! You will be enjoying good food with good ambiance and a lot of AIESEC spirit! Please kindly RVSP as soon as possible! First come first serve! Tickets are sold at RM180 per ticket but if you are an AIESEC Alumni Association Life Member, it is only RM120 per ticket. Life Membership is only RM150! together with your name and contact. Hi, greetings to all AIESEC outgoing members. Alumni membership form will be available soon. Thanks for all the request and interest shown in our AIESEC Alumni. Pls click on above picture to enlarge. – After collecting your baggages, please proceed to the Taxi Counter ( ONLY one) and purchase a “Taxi Ticket” before you exit from the main gate to the public reception area. The taxi will transport you to the conference site. Kindly take note: Taxi Ticket only be sold at the counter before you exit from the main gate. Our reception will be holding a bunting with AAGC logo to welcome you ! Here’s the mailer for all the delegates participate in AAGC2009. In case you do not get our email, you can download it here. We will keep updating with more info. We appreciate all delegate who have not fill up the info survey form to do so soonest, at least we need your flight and arrival / departure time for our reception planning. Attached pls find Visa Requirement for Foreigners entering Malaysia. Please download and check for the country you are traveling from. If you want to personalize your laptop sleeve, you can submit your own design! “heART on sleeves” is an international charity-based project that supports youth development program. AIESEC is collaborating with Alicewonders on this fundraising campaign for AIESEC International Congress 2009. Thanks for all the overwhelming email and request. The post conference tour is up, pls refer to the Post Tour Page (Tab) for more infomation.